I grew up with a love of water and a desire to know how things work. Our family spent every summer sailing and this exposed me to weather forecasts, tidal charts and the ever changing bathymetry maps of the Dutch Wadden Sea. I went to study Meteorology and Physical Oceanography at Utrecht University in the Netherlands, which taught me about all of these subjects. 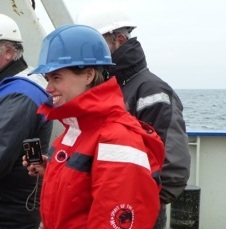 My master thesis started with a field expedition on the WOCE (World Ocean Circulation Experiment) AR7E section in the subpolar North Atlantic Ocean. I loved the exposure to real data, as opposed to the simplified (but solvable) theoretical problems that were given to us at the university. I remained to do my PhD at the Royal Netherlands Institute for Sea Research (NIOZ) on the inter-annual variability of the subpolar gyre. After my PhD I got the opportunity to go to the Woods Hole Oceanographic Institution on a postdoc scholarship. I loved being in a larger physical oceanography department which included a very diverse set of scientists and topics. My postdoc advisor there taught me about Lagrangian experiments, which were a nice addition to my Eulerian background of moorings and CTDs. I also use model data output to better understand our observations, which are necessarily sparse and sometimes gappy as well. After three years in Woods Hole I got a position at Duke University as a research scientist. Just a little while later there was a possibility to work at NIOZ on nearly the same topic. I proposed to combine the positions, a combination to which both employed kindheartedly agreed, which allowed me to get extended experience in the US while also spending time with my partner in the Netherlands. This solution to the well-known two body problem is meant to be temporary, but is serving me well for now. Part of my work is on a subset of the OSNAP (Overturning in the Subpolar North Atlantic Program) array. This array is meant to measure the Atlantic Meridional Overturning Circulation, similar to RAPID-MOCHA, but at higher latitudes. In the future it will be important to have these kinds of monitoring arrays to keep track of ocean changes while at the same time doing smaller scale studies that teach us about (multi-disciplinary) processes we do not yet completely understand.